Home→Craft Projects→Frugal DIY Plant Holder Out of Old Pans! Frugal DIY Plant Holder Out of Old Pans! 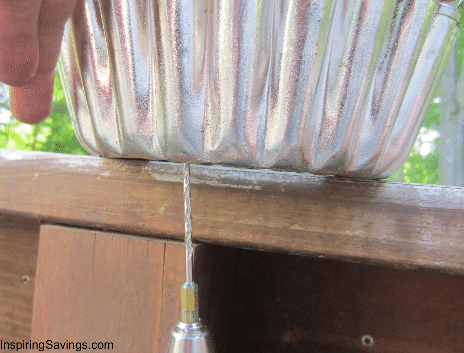 Learn how to transform old pans into planters for your porch, patio, deck and more with this Frugal DIY Plant Holder tutorial. They’re the perfect statement piece to plant and display indoor house plants too. You can decorate your entryway, foyer or office with DIY plant holders. 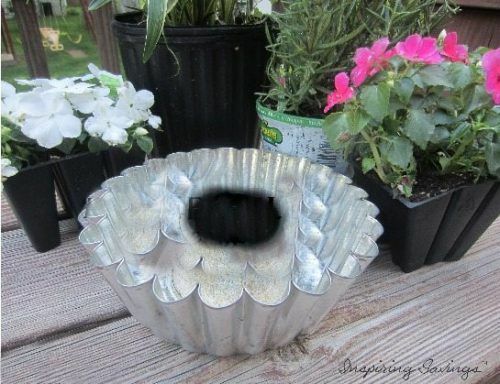 Recycling old pans to make a beautiful summertime piece. How to Make Frugal DIY Plant Holder Out of Old Pans! This weekend our family spent lots of time outside beautifying our yard. One of the highlights was taking some of our old pans and turning them into frugal plant holders. We also went from mowing to laying mulch, we did it all and seriously tired ourselves out (Can you say Pizza for supper?). I didn’t mind this kind of work at all and my kids, LOVED IT!!! They have never looked so dirty. But during our outside time, I had an AMAZING aha! Moment. About a month ago, my grandmother gave me a bunch of baking pans. She knows that I love to bake, especially cakes. However, some of those pans were not up to baking standards. Each pan had its own unique wear from use, like small specks of rust to really baked on food. I wasn’t ready to throw them out yet. In fact, I thought “how can I up-cycle them?”. Then came my Aha! Moment. That old tube pan would be perfect as a table top umbrella planter. The tube pan’s hole is the perfect size to put my outside umbrella through. I went to Home Depot and grabbed a few packs of annuals (which are on sale this time of year). 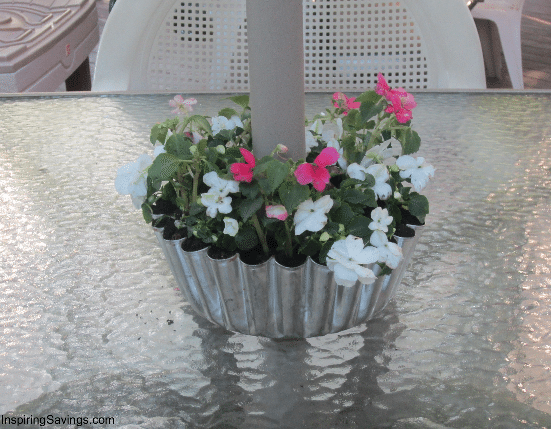 Here is how I turned my grandmother’s old tube pan into a pretty and frugal planter (oh, can’t forget to GO GREEN!). The start of spring means you can expect a bunch of sale on plants. You can also repurpose plants you have already growing around your home. First, before adding your dirt & plants drill some holes for irrigation. (Ignore the fact that my hubby drilled the holes as an afterthought. I was so excited I started planting away and never thought irrigation. Good thing my husband is a GENIUS). Lesson learned. Think before you act. Does your excitement let you get carried away too? Then you want to add in your dirt. Leave enough room for your plants and enough to water your plants. If you put in too much dirt it will spill out all over your lovely table. You will not want to clean up an extra mess, believe me. Start adding in your choice of plants. The arrangement is all done by your imagination. I love the color, so I went with brightly colored annuals. The Final Results (beautiful might I add). Keep in mind, if you want to add a few more personal touches you can always paint the outside of the pan. Pretty Neat AHA!!! Moment. I don’t get them often. If your out and about this weekend and spending time at yard sales. Seek out those old unwanted tube pans or better yet check your cabinets. My afterthought… got me thinking about rust. I know we will be watering these plants often. I am almost thinking it would be a great idea to plant these pans with Rustoleum to prevent further rusting. Which I will do the next time I transform another old pan into a plant holder. 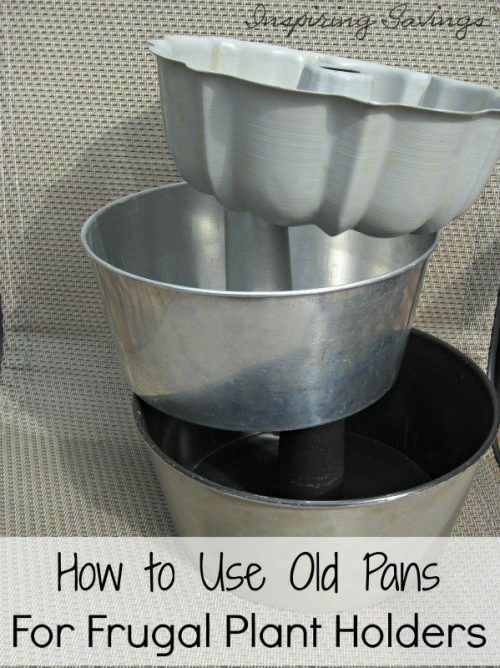 I hope that this article has inspired you to start to upcycle and repurpose those older pans. How To Start Your Own Herb Garden! This is genius! Did you put it on Pinterest? Thanks KAT!!! It was the first thing I did. I love Pinterest. I can tell you now I should have painted it before using it. It has ugly rust marks. I may try rustolium (Spelling??) when I dump it at the end of the season.